“When we show leadership, people respond, and that includes when we show by an election that we’re an inclusive country — whether that’s about an LGBT leader or in some other way — that other country leaders would actually be, to some extent, forced by world opinion to make some advancements. It’s one of the things that’s at stake right now if America is not trusted, is not respected, then it won’t much matter what we have to say about that or any other human rights issue,” the South Bend, Indiana, mayor said. This week Buttigieg scored his highest Democratic primary national poll number to date, at 4% of Democrats and Democratic-leaning registered voters, according to a Quinnipiac University poll. “There’s this intangible energy you can just feel when I walk into a room,” Buttigieg said. But to win in 2020, Buttigieg says Democrats can’t just point to the “chaos” of the Trump administration, calling for a serious look into what Trump voters and the President himself are saying. 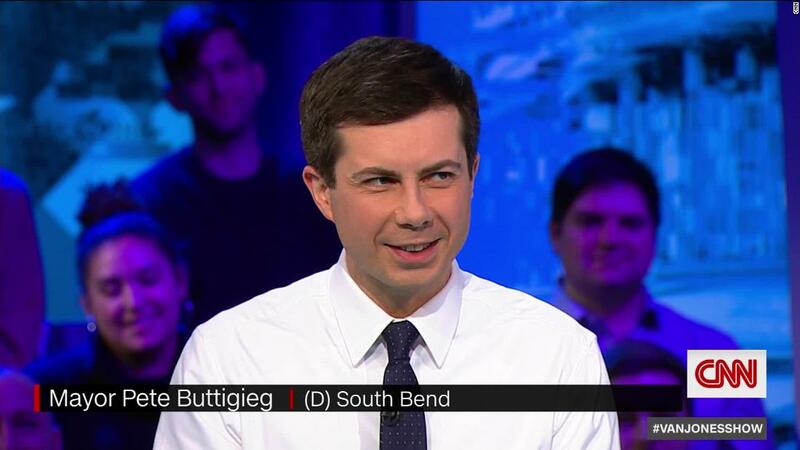 “If [President Donald Trump] is saying the system is rigged — and the way he’s saying it is twisted and not really true, but there’s a kernel of truth in there — and we look like we’re the ones saying, ‘oh no, the system is perfectly fine,’ then we’ve got a problem,” Buttigieg said. “The problem is normal wasn’t working for a lot of people,” he said. Buttigieg, 37, said his background as a small-city mayor in a red state allows him to reach voters — particularly in the industrial Midwest — in a different way than other candidates. “They just haven’t heard from us in a while. And I think coming from that part of the country, as well as the generational background that I have — and the background of being a mayor, which just puts you in a different headspace, I think — than if you go to work in Washington every day. I think that that just might create a way to reach people differently,” he said. Buttigieg discussed diversity among the 2020 Democratic candidates and slammed Trump’s rhetoric as sowing division in the country. “Right now, identity as means of division is being mastered by this White House. We’re in a moment of peak white identity politics. And it’s being used to divide us across the working middle class, to divide us regionally, to divide us on partisan lines,” he said.